Cypress trees are coniferous evergreens with fine, needle-like foliage. They vary greatly in size and shape, from towering swamp giants to small, shrub-like trees. Many of these hardy trees are popularly used in landscapes and home gardens. Their fast rate of growth, up to 2 feet per year, according to the University of Illinois, makes cypress trees an attractive choice for home gardeners who want a tree that will make an instant visual statement. The rare MacNab cypress is found only in the state of California. 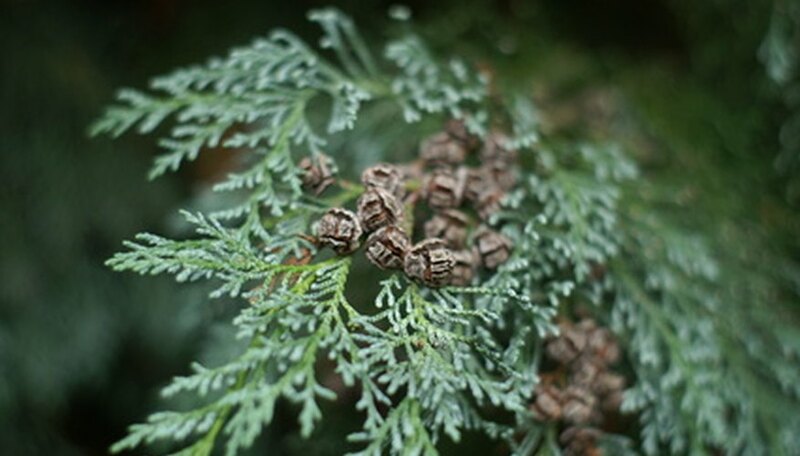 The needles lie in a form unusual to most cypress trees, according to the Gymnosperm Database. Instead of lying in all directions, they lie on the same plane, facing the same direction. The foliage is dense on these cone-shaped trees. The trees themselves can be shrub-like in form, especially when used in home landscapes. In the wild, MacNab cypress trees can grow to a maximum height of about 40 feet. Leyland cypress trees are popular for their rapid rate of growth and pleasing, conical shape. They are often planted in rows and used as windbreaks or screens. These are the fastest growing of all cypress trees, growing as much as 4 feet in 1 year, according to the University of Florida. Leyland cypress trees can grow even when planted in poor soil and can reach a maximum height of about 50 feet if left unpruned. The rapid rate of growth of these trees causes a number of problems, however. Leyland cypress trees easily split in ice or windstorms. They are also prone to suffering from Bagworm infestations, which can be serious. These insects can completely defoliate a tree in one growing season, and there is no way to prevent the infestation. Italian cypress trees have a tall, very slender profile that lends themselves well to formal landscapes and architecture. These trees can reach a maximum height of 60 feet, with a width of only 3 feet. Italian cypress trees are often planted in rows, lining a driveway or border. Although visually striking, they can sometimes grow to be too large in scale for many home gardens and should be used with caution, according to the University of Florida. These trees do not like overly wet soil and can suffer from fungal diseases. Kashmir cypress trees have a graceful, weeping form. The foliage is an attractive blue-green in color. Kashmirs are considered the be the most attractive of all the cypress trees, according to the Gymnosperm Database. The cones add even more visual interest to the tree, being perfectly round in shape and a rich, shiny copper in color. Kashmir cypress trees make excellent specimen trees.